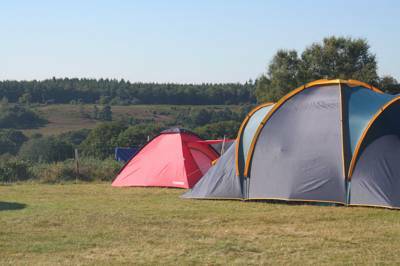 Come experience a traditional Hampshire holiday camping at our New Forest Pony farm. Hurst Castle is not your archetypal fort-shaped building. Thanks to the Napoleonic wars it has long, rather weird looking flanks that bend around the coast. Its centre is still the rotund stone castle that Henry VIII commissioned though, sitting like a circular watch face in the middle of two ginormous granite straps. The castle's shape mirrors the curvature of the spit on which it resides, an outlying strip of shingle that runs in to Milford-on-Sea. And it’s on the other side of this village that Muddycreek Farm resides. Like the castle, Muddycreek Farm has been here for years and, while much of the countryside has seen an infringing urban invasion, the fields here have been largely untouched. The countryside is a patchwork of agricultural colours and, to the north, the vast New Forest wears its national park status with pride. It’s the perfect setting, then, for a campsite and a pop-up one at that – a tent-only haven that drops into existence for 28 days of the year before returning back to nature. Muddycreek Farm is a campsite that gets it right. There’s no swimming pool, no laundry blocks, no strings of static caravans. In fact, if you came here in mid September you’d never even know the site exists. Yet in the height of August the 60 pitches each harbour a colourful tent, enlivened with the quiet hum of satisfied campers and kids yawning in their sleepbags. "Hmmm... 60-odd tents?! ", you say? It may sound a little full, but with an expansive 15 acres of space there’s no such problem here. Peg down in the soft grass and fold out your tables and chairs, there’s no danger of feeling hemmed in by other peoples guy-lines. It’s best to leave the site on foot to get into Milford-on-Sea. The village centre is only 10 minutes away and the coast a little further. If the short stroll is enough to get you thirsty then try stopping in The Beach House, a fine pub with great sea views and a child-friendly garden that backs onto the cliffs. Hurst Castle still makes for an excellent walk along the beach and acts as a wonderful lookout point for views of the Solent Coast as well as, on a clear day, the distant Isle of Wight. But from the rooftop it’s inland that often catches the eye, as the New Forest sweeps away before you, fronted by the rooftops of classic Hampshire villages. 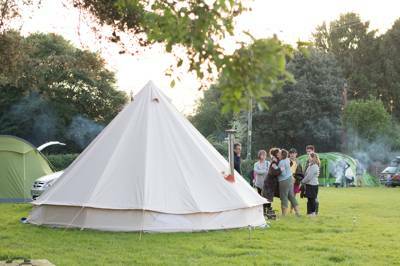 What the views from the castle seem to capture is the eclectic location of this campsite: cycle-friendly woodlands to explore, beaches on the doorstep, wetland nature reserves and charming Hampshire towns. Muddycreek Farm has a wealth of activities in the vicinity while the site itself still wears a relaxed, unobtrusive aura that’s not in-your-face. When you want to retreat into the atmosphere of the outdoors, simply light a campfire, grab a skewer and enjoy toasting on the campfire beneath the stars. Afterall, that's what it's all about. 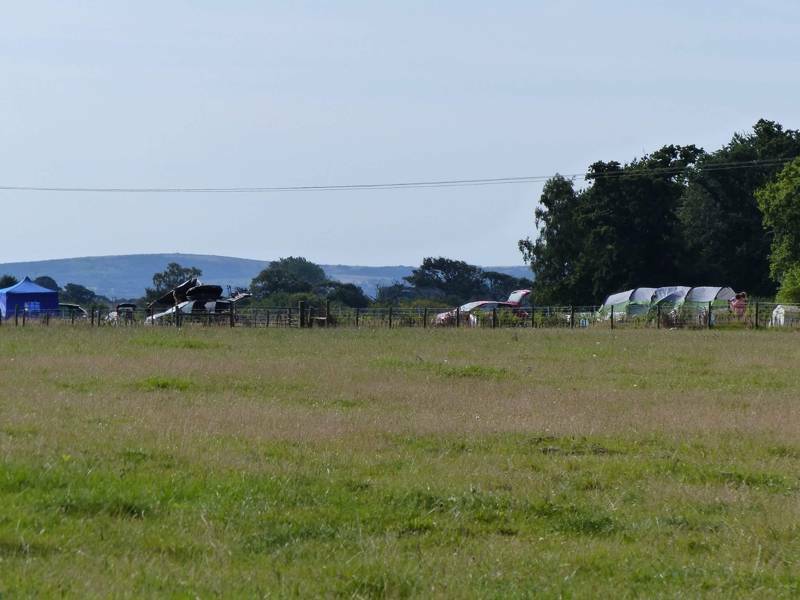 Throughout August, our traditional New Forest Pony farm is open to tent campers and campervanners for just 28 days. Our loos flush, our showers are hot, we allow dogs (for free) and, Fridays are pizza night... best of all, you can make your own campfires! 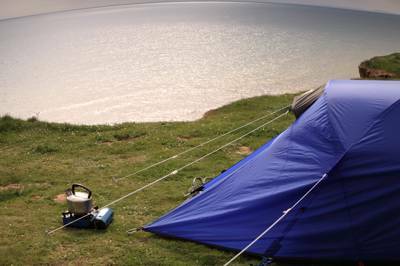 We don't have set pitches so you can choose your perfect spot and easily camp together with your family and friends. Situated in the charming coastal village of Milford on Sea, Muddycreek Farm lies on the edge of the New Forest National Park. Wonderful beaches, shops, pubs and restaurants are all within easy reach. 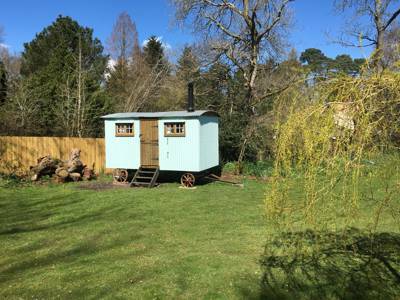 We're ideally located to exploring the New Forest. There's a shingle beach just down the road and plenty of fishing opportunities for anglers. For latest availability and best prices for Muddycreek Farm, please use the Date Search above. 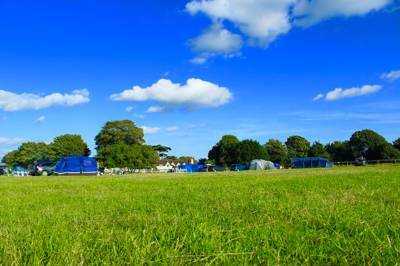 60 pitches across 15 acres of space. Showers, toilets and washing up facilities, plus a freezer for ice-packs. Small campfires permitted; wood for sale at reception. Muddycreek breeds New Forest Ponies and riding is easily arranged with one of the local riding schools – ask on-site for details. The farm is within walking distance of Milford-on-Sea, a well-stocked village with shops, pubs and restaurants. The seaside town has a shingle beach and there is a lovely walk along the coast to Barton-on-Sea, skirting the top of a low cliff. Hurst Castle (08703 331181) makes for another great walk. Start at the pretty village of Keyhaven – little more than a cluster of boats with a great pub by the waters – and take one of the regular seasonal ferries across to the old fort. Once you’ve finished exploring the atmospheric rooms and admired the views, you can walk back via the 1.5-mile shingle spit, returning to Keyhaven via a narrow road that skirts a marshy nature reserve. 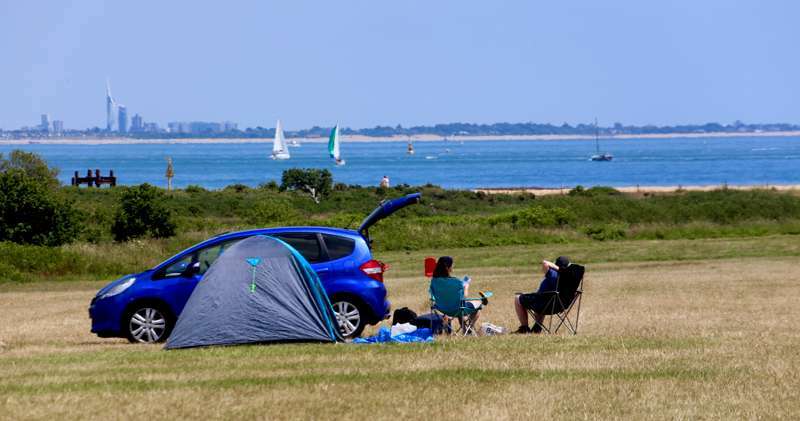 Along with the coast a huge draw is the vast New Forest, right on your doorstep, and its excellent traffic-free cycle routes – keep quiet to enjoy the best of the wildlife. Lymington (01590 689000) is a handsome, well-to-do harbour town that warrants a day or so out of anyone’s itinerary. The old town, clustered round the quay, is an attractive medley of cobbled streets, boutiquey shops and cafés – all just 4 miles from the campsite. Milford-on-Sea is technically a village but it's town-size proportions mean there's a wealth of choice to be found. For a traditional ol' pub try The Smugglers Inn (01590 644414), right in the heart of 'town', or The White Horse (01590 642360) near the village green. The Beach House (01590 643044), is a particularly good spot, serving wonderful local draft ales and good quality food. It's also a fantastic art deco building, which still retains the original fittings such as stained-glass windows and oak panelling. In terms of restaurants The Raft (01590 645300) and La Perle (01590 643557) are two top bistros while Verveine (01590 642176) is the place for fresh (and rather fancy) fish. Open for 28 days in August only. Adults £8/£16 (weeknight/weekend-night), children (3–14yrs) £4/£8, under-3s free. Dogs free. Travel towards Everton on the A337 and turn onto the B3058 sign posted Milford on Sea. After approximately 1 mile you'll see the sign post for Milford on Sea Village where you need to turn immediately right into the field access. If you pass South Lawn Hotel on the same side then you've missed the turning! If heading toward Everton from Milford Village the access is immediately past South Lawn Hotel on the left. The nearest train stations are Lymington and New Milton with bus services to Milford Village from both.